A "Peace" of Mind – "There may be those on earth who dress better or eat better, but those who enjoy the peace of God sleep better"
"There may be those on earth who dress better or eat better, but those who enjoy the peace of God sleep better"
The name above every other name. The Hebrew name of God, made up of only four vowels, it is said was only pronounced on Yom Kippur by the High Priest. The Hebrew texts spell God’s name with only consonants: Y-H-V-H, a calledsol the “Four-Letter” name or the Tetragrammaton in Greek. I cannot imagine, not being able to call on the name of Jesus. Yet this was not punishment; the name, it was a holy name. It was in honor and love and respect that they were silent. They knew the power that comes with the name of the Lord (even if they didn’t really know THE name). As you can read, they would often use the name Adonai in place of the name of God. God has so many names; every one of them has so much meaning behind it. Yet even God, has ONE name that is above every other name. Aren’t we blessed to know that name? To know that we can, and should do ALL things in that name? This unschooling experience….it’s just beginning but so far ..it is amazing! They can struggle? Trusting my kids to learn. Really learn. The other biggest struggle? Not worrying or caring what others think about what my children are or aren’t learning. Currently my oldest son is working to build a table and a wooden briefcase. My younger son designed a drink dispenser and is working on a chair to replace one of ours that is not in the best of shape. As I watched, them today I realized that they are learning so much. Not just from their experience but from being a part of the experiences of those around them. We don’t have any worksheets completed. We’re spending a lot of time online. They are exploring what matters most to them. And when I stepped back and really look, I can see but there is so much more that they are learning. More than meets the eye… I think that was a tagline for something when I was a kid. I think that could be a great line to use for unschooling. I know that some days are better than others such as I stepped back and watch my children, I’m impressed with the gifts that God has given them. and I am so very grateful for the people that the Lord has put in our path to help us and guide us in this journey. Here and there I have had people let me know that it’s okay if I don’t homeschool all of them all the time. I realize as of late that they are right. Nada’s they mean it, but as we step back and give our children room to breathe and get curious it is done that learning begins. it is so true that our children really are naturally Born to learn. and I am so grateful that my children are so patient with me because fear too often I get in their way. then I stepped back and realized but God created everyone of us for good works. He calls us and he also equips us for those works. When we look at it this way we realized that we have nothing to fear. We are always looking for another way to explore science. We have all the curriculum, we have the books to read, the books to do, even videos to watch and listen from. Some days this works pretty well for my kiddos – other days its a real challenge – Science is so cool though! I desperately want to see my kids get excited and engaged in the world around us that is totally science. CrossWired Science is a unique and fun way of studying science using global topics. CrossWired Science provides a growing library of lessons for all ages. 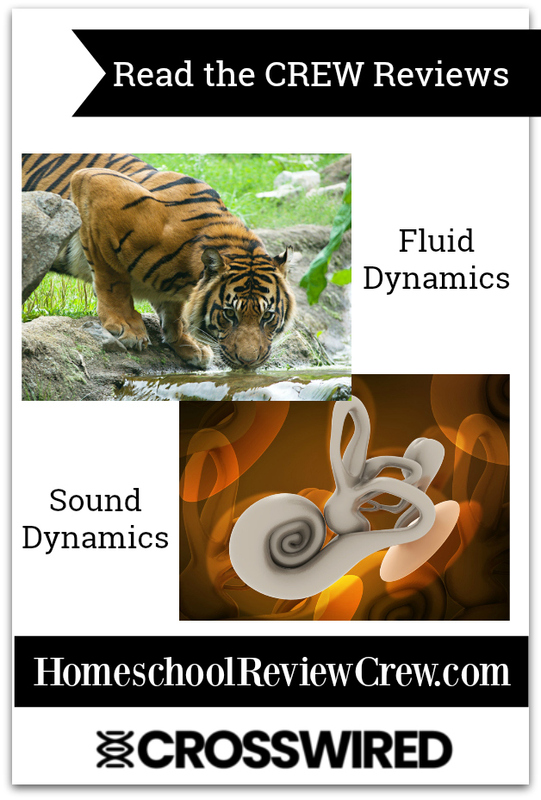 For this review we had access to the global topics: Sound, and Fluid Dynamics. With all the science materials and programs already out there, perhaps you are wondering why this one? Let me say, you can get a bigger picture of how and why they do what they do here. For me, I just love how they strive to help others to see all that God has done; to recognize His goodness in the world around us. Without recognizing the wonderful works of God, can we ever really know Him ourself? While I was very excited for the chance to review this, I also admit I was very unsure of what we were getting ourselves into. I love science. My boys love science. But we never seem to be able to stay in one place or finish the chapter or unit we start – We often wind up off on rabbit trails. We start learning about one thing and before we know it, we are learning about a thousand other things related to that topic. I worried, just a bit, that this was going to be one more thing that we would never really be able to stick with. But I was pleasantly surprised. Honest. What we did receive was a “beta version” of the actual program; this is a work in progress (just like you and I). There are so many amazing things in this though that make it easy to overlook little things here and there. This program has worksheets, quizzes and lots of experiments. It also is designed in such a way that you can really follow where your child’s interest leads you. This is huge when it comes to my two boys! They love how there are links in every lesson that they can follow to learn more about those things that they are most intrigued by. I love that too because we have been really trying to get some kindling on the fire around here; this is great kindling if your fire seems to be dampening or going out. From the video lessons (there are about eight core videos in each lesson) to book readings and experiments we have moved slowly through these, even enjoying devotionals! From bone electricity, to how toucans use their beaks to stay cool there we are learning so much! There are quizzes at the end of each video too so you can be sure to “test” what you have learned. We enjoy doing these together (some competitive spirit here) to see who can get the most correct. And as we work through each collection of lessons and videos, we are able to keep notes because after you see a carrowary swallow an apple whole, you can’t help but wonder what else they can swallow whole? How big can the stuff they swallow get? These are the “Interestables” make this such a joy. And for my older son I love that there are built in research “assignments (dig deeper) to encourage him to really understand and know! What about getting out and about? When you are just at a loss as to how to bring things alive, they even have field trips built in to the lessons. So if you aren’t sure where to go or what to do, they have lots of fabulous ideas. And don’t forget the field trip report. A great reminder of what was learned; a great way to track those questions that come up along the way. Some time ago we actually tried to make a point of journalling our time out and about – this was a wonderful reminder for us to begin this again. The best way to use this resource? Know that it is something that is “in the process” with an amazing group of people working hard to make this something that inspires and shows us all how great our God really is. You can follow the calendars they provide or you can do whatever works for you! I know we love watching the videos and then exploring all the other resources that they have. You never know what each lessons will teach you or where these lessons will lead you! As learners who tend to be pretty “out of the box” (I don’t know if we even have a box anymore ha-ha) this is the kind of tool I really am constantly on the look out for. Sometime that my kids cannot get enough of. And I cannot tell you how many times I had to tell them that they had to be done for the day. Every one of us needs a redeemer to free us from sin. We all need a redeemer to give us hope. Because of Christ we can look forward to freedom and liberty. We belong to God, we are redeemed by his blood just as God’s people where in the Old Testament, at the exodus from Egypt. God is our Redeemer, he offered himself as a ransom for us when he died on the cross. She didn’t free us from the oppression of the world but from the principalities and powers of darkness. God is our kinsman redeemer; he stepped in and paid off a debt that was not his so that we could be free. We re made In His image when we are redeemed. “you are worthy to take the scroll and open it CL because you were slaying and with your blood he purchased for God members of every tribe and language and people and nation. He gave his life that we could be saved out of disobedience into his obedience. We have been in and out of unschooling for about a year now. We do it and then we don’t. Such a lack of consistency. Until recently. I don’t know how I missed it but I did. I went and rid our house of all of the formal curriculum and programs for learning and we jumped right in to unschooling. I spent days getting out puzzles and snap circuits, we stocked up on marker is in paints and all sorts of crafty things. It never occurred to me once to take the time, for myself and my kids, to deschool. To really deschool. If you are not sure what deschool is, let me just say that it is necessary. For anyone who is beginning their journey into homeschooling. For moms and dads; for kids too. Because we all think we know what school is supposed to look like. And that is how every one of us can wind up making homeschooling worse. What would you do if there was no such thing as school? How would you do the things you need to do? A big part of deschooling is living for an extended period of time as though school didn’t exist; this is a time when we detox ourselves some all of our preconceived notions. We break those chains. We set ourselves free. We have never really done that. We pretended to deschool; I have allowed my children sometimes days and sometimes a week or two. But this is not enough. It has never been enough. For the most part my kids love to learn, but they quickly got burned out on programs and curriculums and worksheets. I remember hating those when I was a kid too. Of course we are all convinced that this is the only way to learn. We have to follow a certain pattern, our children have to know specific things by a specific time or else…. In a conversation with another mom at my kids gymnastics class, we were talking about this very thing. Especially my oldest son who is soon to be in “high school”. I loved her response to me when I shared my anxieties and fears about his learning. He struggles with math. He hates to read. In many ways he is very advanced for his age while in other ways she is very behind. I admit that initially I thought it was kind of flippant and immature. But as she continue to explain this to me, it was like a light bulb went on. What really matters? Whatever things are children really do need to know? certainly memorizing dates and places and historic events can be nice but does it really matter? If they know how to learn, if they are able to think critically and search out whatever they need .. maybe they don’t know it when the world says they should but so what? So here’s what I am doing right now, to deschool myself. My children are deschooling along with me. I have made myself some promises, they will be hard to keep. For now I will not do any curriculum, and I will not download any free learning materials no matter how awesome they look. I will be still. I will let it go. I will trust my God. Another thing we are doing is avoiding planning. this doesn’t include the fun opportunities my kids are a part of. They do woodworking every other. There is gymnastics and lots of time on the ice; there is leather working and there are lots of zoos and museums and parks to enjoy (at least when it finally gets warm here in Wisconsin lol). I have promised myself that I will not sign every moment of the day but I will step back and wait to see you organic learning happening with my children. I also promised myself I will read. I love to read but I don’t do as much as I would like. I am sure many of you have seen pictures of piles of books but I have all over our house. Many are on homeschooling, often unschooling. I promised myself to read them all. John Holt, John Taylor Gatto … A host of websites and resources that I have collected but never really dug into. I will dig in now. I will search for more. I I will try the cast my fears and anxieties on the Lord, after all I am responsible for my children’s education right? But how much are they learning just living day to day. It’s challenging to forget about school and grades and subjects. Yet it is fun to live everyday as though it were a Sabbath day. We can slow down. We can enjoy one another. I can step back and watch my children. Really get to know them and understand what makes them tick. I can see for myself the things that they love and then go after them. Free homeschool that trend I have talked to recommends one month of deschooling for every year the child was in school. That is such a long time. Especially for my older one. And wild he has always been homeschooled, the school they speak of is the one that operates just like the schools so many of us know and do not love. What if life is really can be our curriculum? When I stepped back it sounds crazy but not that crazy. This is a way that is holistic. It is when we see everything as connected. As my children drive to monster trucks and fly their drones; small my daughter knits and makes her own hair bows, I can see you the many things they are learning. Our our children want to learn. They will learn. They do not need our help. How many of us had to teach our babies how to walk? We simply have to trust them and in turn trust ourselves. Not an easy task but one has anything worth doing ever been easy? When you do not force our children to learn, our children will learn what they need when they need it, learning simply by their own desire. This is what we need. This is what I want for my children. Don’t you?